By nature, I am an obsessive note taker. I have piles of “idea-sketchbooks” and every so often I will pull out an old one and read through my notes. Recently I was reading through an idea-sketchbook from January 2013 and I came across my notes from a Daniel Sprick workshop I took at Studio Incamminati. I want to share some notes I wrote down during the workshop describing Daniel’s methodology and thought process. Why are Simple Things Special? Have you ever wondered what makes simple objects so special and remarkable? This is something I ponder, and have never found an exact reason it is so. Instead, my reaction is more from the gut, often I respond emotionally to a scene on a very unconscious level, where I just feel a sense of happiness, connection, and warmth. I think these feelings are universal, and have always been a part of our lives. In 18th Century France, when art was dominated by the highly refined Rococo style, Jean-Baptiste-Siméon Chardin chose to celebrate the common, treating still life with a respect that was hardly given any attention by his contemporaries. At the time, history painting was considered the supreme classification of art, and the genre of still life was relegated to only being the decorative background to more "serious" work. Instead Chardin imbued his paintings with a beguiling sense of appreciation for the here and now, celebrating the present by identifying the beauty found in common household objects. Simple groupings that still resonate today because his paintings present scenes of common objects that evoke the sense of looking through a window, not our own and not of our time, but still reminiscent of our own lives. 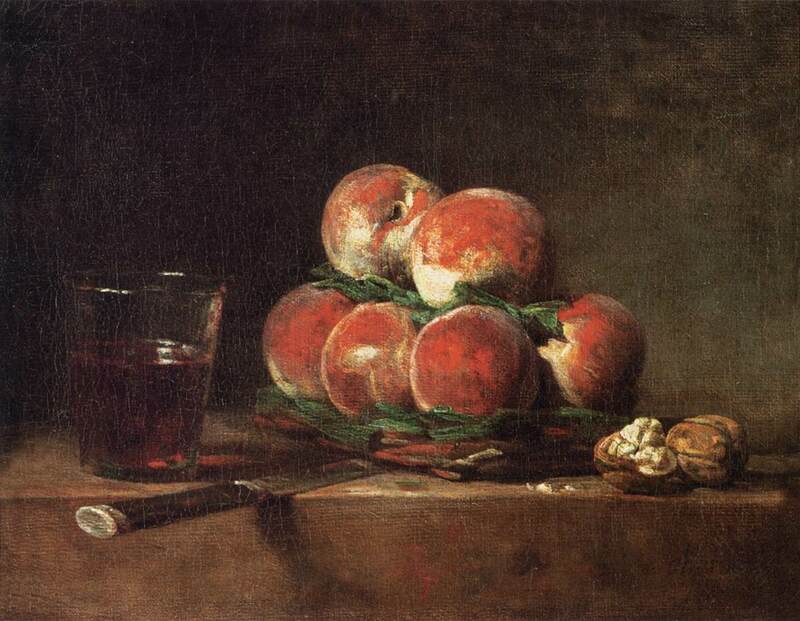 I still remember the first time I was exposed to Chardin's work. It was as if my world had just expanded. And my attitude towards the simple objects that populated my life had just gained a new level of appreciation, because everything was now given an opportunity to be seen as special and unique. This awareness made me more willing to pause, observe, and appreciate the simple things in my daily routine. Do you think simple things are special? What Colors Do You See in Shadows? I still remember the first time I observed "purple" in a shadow. I was walking across the Key Bridge from Georgetown to Roslyn, VA and I noticed how yellow the white concrete pavement appeared, then I noticed the shadows of the railings were a bright violet. It was magical, and I felt like I was now a friend of the Impressionist Camille Pissarro. This painting by Camille Pissarro created quite the stir in the French academic art circles when it was first publicly displayed due to the patterned shadows on the ground. First off, the shadows were painted in blues and purples, and secondly the alley of trees that were casting the shadows were not presented within the picture plane. At the time, not including all the objects that established the composition in a painting was taboo, and painting in the vibrant new colors available to artists was also revolutionary. The Impressionists did the world a service by depicting the colors seen in life, now the joy of discovering and perceiving the bold and vibrant colors that fill our world is open to anyone who takes a moment to really look. So this afternoon, I want to encourage you to observe the pattern of shadows that cross your path. What colors do you see in the shadows?